Important message to all Upstream Oil and Gas companies large and small. 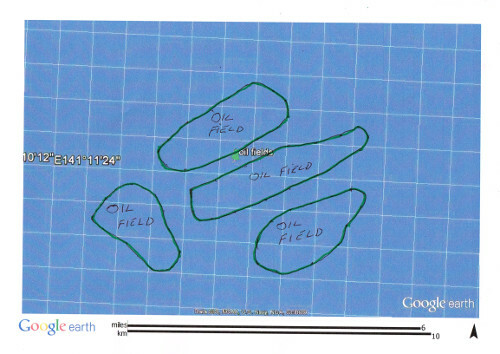 The last three years I have been developing a method on how to locate oil and gas hot spot locations worldwide, over 623 hot spots oil field locations to date. Depths and quantities can be given for these fields upon request, subject to contract. 130 Gas locations, 90 Oil & Gas locations found so far worldwide. These locations are separate from my existing clients fields already discovered. Confirmation of Peter's ability ...Chevron's testimonial confirms Peter's ability in the field of seismic research in locating oil and gas fields. How does oil and gas surveying work? Remote surveying of the sites includes the size and shape of each field, including structures, faults and fractures etc. Depths and quantities as well as the feasibility of the field are included. Also included in the survey is the gravity of the oil, and the porosity of the rock. Once the sites are located by remote surveying then a site visit can be arranged. This will help oil companies in saving money on licensed areas where there may not be any hydro carbons present. Peter has 20 years of oil exploration experience from 1993 he spent 5 years researching into the geology and the structure forms of hydrocarbons. Before Peter approached any Oil Companies back in 1993 he spent 5 years research into the geology and the structure forms of hydrocarbons. His research is ongoing 20 years later with good results. He also map dowsed to cross reference his findings to confirm and validate that they were correct. And he practiced his skills by getting someone to bury oil in a field for him to find. This gave him the confidence and experience to contact the existing UK Oil & Gas Companies in 1993.